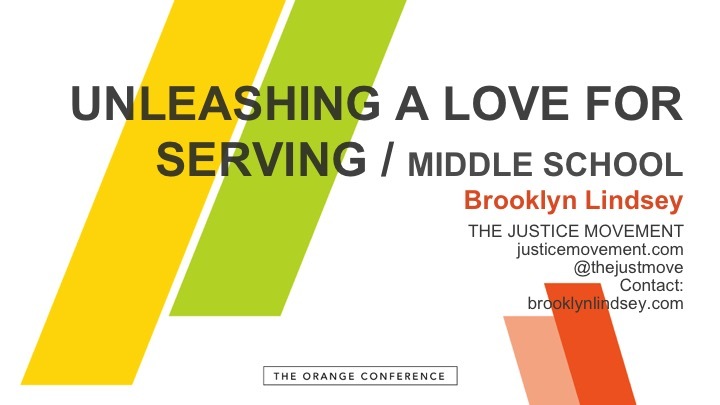 Today I get to spend time with friends at Orange Conference talking about how to unleash a love for serving in middle school ministry. I’m super passionate about what it looks like to lead students to meaningful relationships (with God and others) and what it looks like to learn about how God has designed them to serve and live compassionately. Instead of telling a teenager how to serve others, we should practice serving others in front of them, with them, and even when they aren’t looking. I feel like this is a journey that’s both symbiotic and sacred–a place where we can work together in the mess so we can walk a little further into the miracles. There is incredible injustice in the world, brokenness and darkness. But I’m finding it more helpful to focus on asking why the light isn’t as bright as it should be? I know for certain the answer starts with me, a deepening faith, then moves out to each other. We serve stronger and longer together. I’m excited to get specific today about ways we can unleash the love!